Do you ever remember your mother telling you to sit up straight, that it was bad for you? Fast forward 20 years and now you have shoulder aches, neck pain and even lower back pain. You think hard as to why you might be experiencing this. Was mum right? Maybe my posture is affecting all of this. It is estimated that 65% of sitting employees suffer from a combination of neck, upper back and shoulder pain. It is clear that having bad posture while sitting down or even standing up can lead to various negative side effects. When we consistently leave ourselves in a vulnerable position we are preventing our body to function at its best. Here are few negative side effects caused by having a bad posture. Our main organs responsible for breathing are the lungs. They are situated in the upper part of our chest and they help send oxygen to all areas of our body. When we slouch we decrease the space where our lung sits which limits the amount of air that we breathe in. It is said that we lose 30% of our lung capacity when we lean forward. Ultimately we get reduced oxygen levels to our heart and body. In the long run this can cause many serious health problems on its own such as; dizziness, fatigue and headaches. Our body is designed to stay upright. However when we are slouching, our body is fighting to be in its correct position. Having to fight against poor posture requires more energy, leading us to feel tired and fatigued. When slouching forward this makes the muscles on the back of the head work harder. As this creates extra stress for the muscles it can become quite inflamed leading to pain. Also as these muscles become tighter it can put pressure through the head leading to headaches. You might be wondering why bad posture might cause lower back pain. As the muscles behind your neck tighten up it can create extra pressure through the spine at that level. Due to this extra stress that area may become more prone to injuries. To take that extra pressure off other area will try to compensate, especially through the lower back. Also when you slouch down you lose the natural curvature of the lower back. The curve of the spine acts like a spring which helps distribute weight. When you lose that curve all the forces go through the joints of the spine. With all these stresses put on the lower back, lower back pain is quite common for people with bad posture. Having poor posture isn’t the end of the world. Like most things as long as you put effort into it, your posture can improve. Here are some basic exercises and stretches that can help improve your posture. 1. Cobra Stretch – This stretch helps you work out opposite muscles that assist in bad posture. Hold this stretch for 1 – 2 minutes. 2. Hip Flexor Stretch – When we sit down our hip flexors are in a contracted state. Having tight hip flexors can lead to lower back problems. Hold this stretch for 1 – 2 minutes. 3. 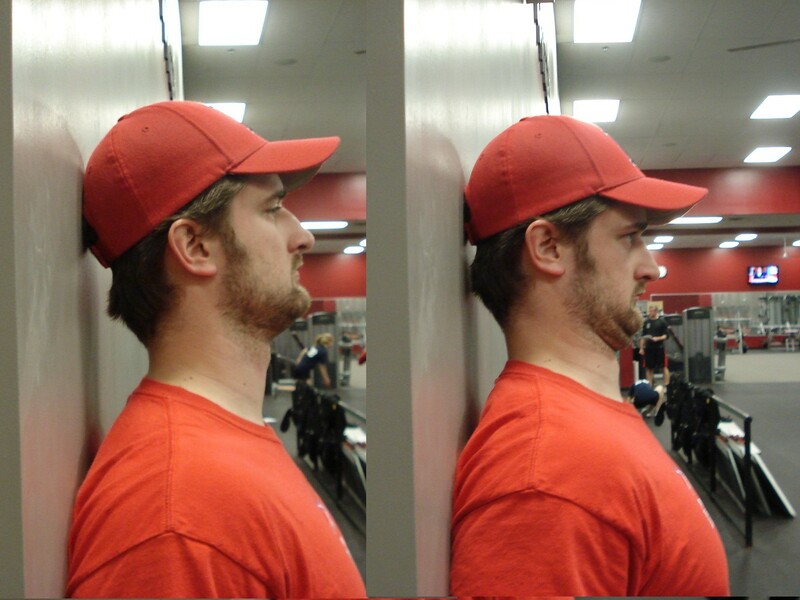 Chin tuck – performing this for minimum of 3 sets of 10 reps daily. 4. 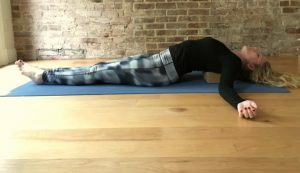 Thoracic extension – Put the block up higher by the base of your neck (in between your shoulder blades) and roll up a thick towel to put in your neck curve. Holding this position for up to 2 minutes or more if you can.